A couple of months ago whilst at work I came across a Melanie Martinez cover by an artist called Rebecca Shearing, so thought I would google who this Melanie Martinez was as the song was quite interesting. If you’re a fan of the dark TV show ‘American Horror Story’, you might’ve already heard of her, as her songs Carousel & Dollhouse have both featured on the soundtrack! After listening to Melanie’s debut album ‘Cry Baby’ on Spotify for a couple of weeks and enjoying the Electropop tunes that tackled some interesting topics (unlike the usual love/relationships), I was happy when I found out she had to London dates in May… Sadly by the time I realised, both dates had been announced, tickets had gone on sale aaand it was totally sold out. Gutted! Fast forward to last Saturday and after I was sufficiently jealous my friend Catherine was going to the gig, so I took to Twitter and thanks to a very kind Melanie fan (shout out to @_renatewolf_) I managed to get hold of a ticket last minute (and for face value) for the second and final London show of this tour. As a former ‘The Voice’ US contestant from 2012 (on Adam Levine’s team), I was a little skeptical about how her performance would be, because reality tv singers can be so hit and miss, but honestly, I was very pleasantly surprised. Vocally she was pretty much spot on throughout the whole set (despite saying she had had a sore throat days before and was struggling with high notes), and almost entirely true to record, which is quite rare with “pop stars”! 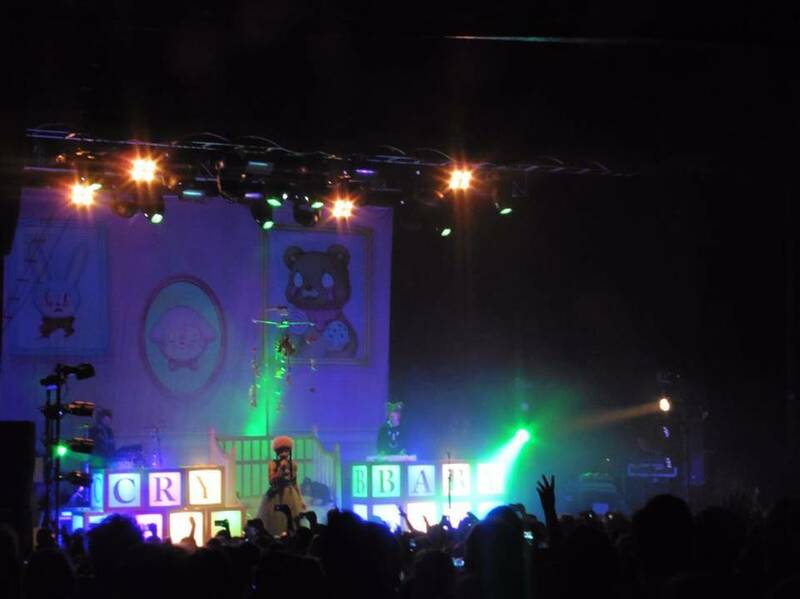 Visually the stage was set up as if it was a child’s bedroom – with an over sized cradle in the middle (which she emerged from at the start of her set), a large nursery mobile which twinkled above it and large building blocks either side that spelled out “CRY BABY”. As well as this the two musicians on stage had animal head gear on – fluffy, with bear ears. Style wise, she channels some serious Cruella DeVille vibes with her half black, half coloured hair, plus a combination of porcelain china doll, and MySpace emo kid circa 2007… But with extra added fluff & pastels. 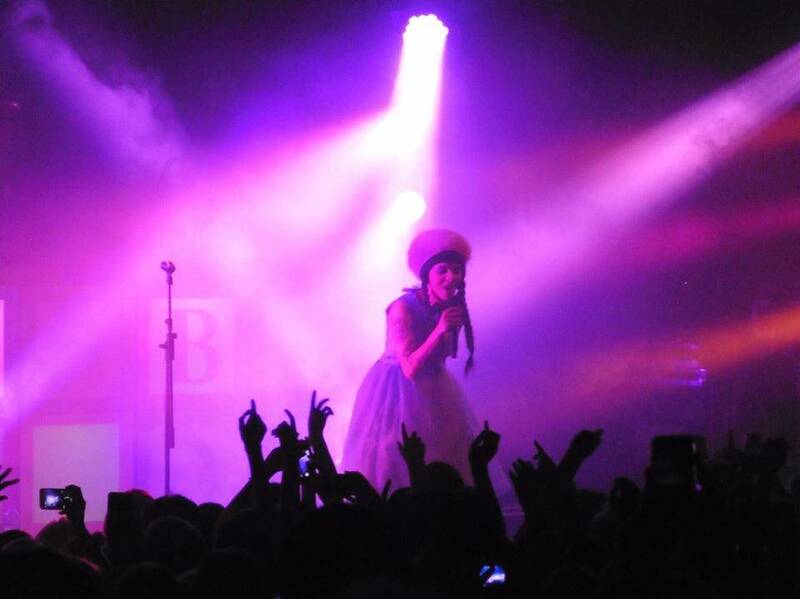 On this occasion she had a cutesy prom style dress and fuzzy beret style hat*, which, coupled with songs about very “grown up” problems and dark themes (with a couple of swear words thrown in for good measure) is quite a funky juxtaposition. In her songs ah addresses some of the problems in society: for example Mrs. 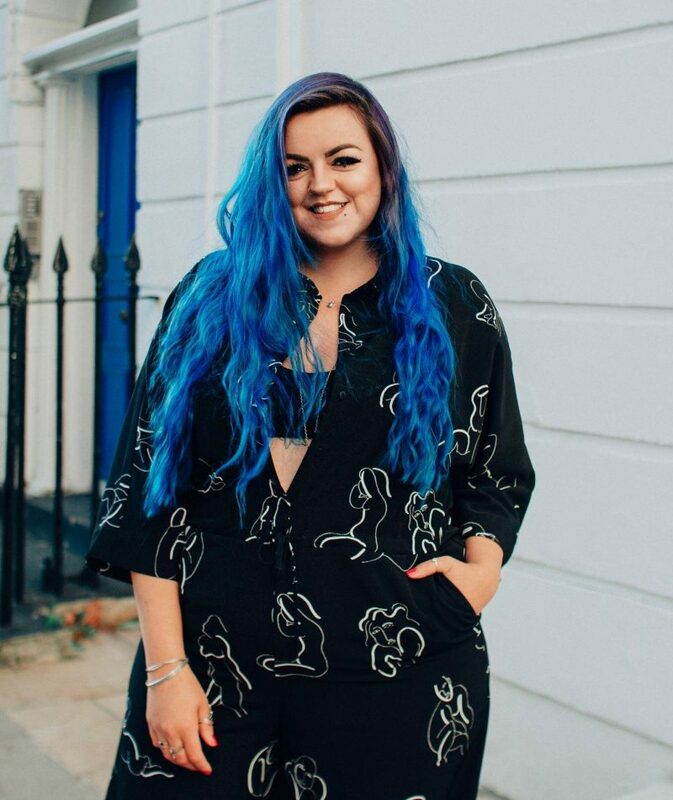 Potato Head explores our perception and obsession with aesthetics and body image, with one of the hook lyrics into the chorus being “no-one will love you if you’re unattractive”. She really manages to pull off the life-tragedy-meets-nursery-rhyme approach and I’m sure the concept of her character ‘Cry Baby’ would have given Freud something interesting to write about. Aside from lyrical content, almost everything about Melanie was very child like and bubblegum: her bashful performance style, bopping on stage to her pop tunes, whilst also spending a lot of time facing away from the audience. I was a little disappointed there wasn’t much chit chat in between songs, but I’ve since found out this is because fans like to scream whenever she speaks and she’s been known to have a strop about that in the past. A personal favourite, track wise is lead single from the album called “Pity Party”. This song is heavily influenced by the 1963 classic “It’s My Party” by Lesley Gore. It’s a brilliantly bratty pop song, check out a clip below, featuring “the scream”… You’ll know what I mean when you watch it. 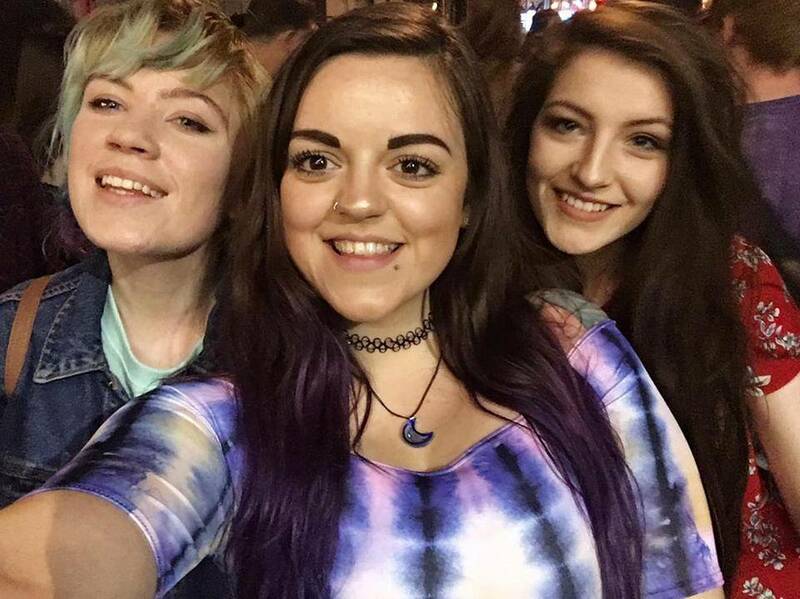 The crowd at this gig was an interesting one, similar to that of Halsey at Brixton academy in February (I really should post my blog about that) – very young, and very “tumblr”. There were also a few parents present which did make me giggle, I can’t imagine my dad ever agreeing to attend a pop gig with me, let alone bop along and enjoy it, which I did see a couple of dads in the crowd around me doing… When I noticed and smiled at them it was quite sweet how embarrassed they looked, pretending it hadn’t happened, whilst their daughters were blissfully unaware because they were too busy shrieking and snapchatting the entire set. With only one album’s worth of material the set was incredibly short – less than an hour start to finish, but I think that was reflected in the ticket price (around £15), so actually it was quite reasonable. Usually at gigs there aren’t novelty photo booths (although this year some of the events I’ve been to have had one, for example when I went to a Grease themed night at the Hard Rock Cafe! 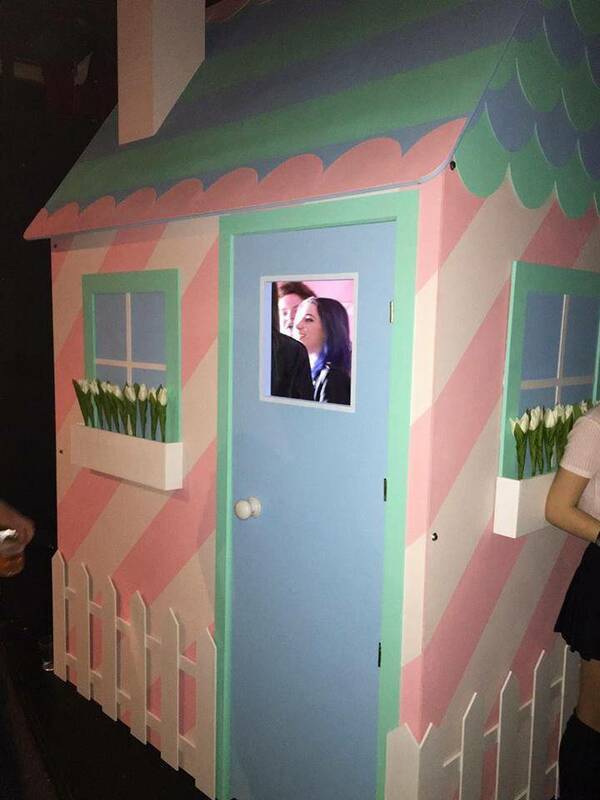 ), however Melanie Martinez’s show had an incredibly cute pink Wendy House (complete with props) which you could go in and pull some silly faces, to create a gif like the one above! 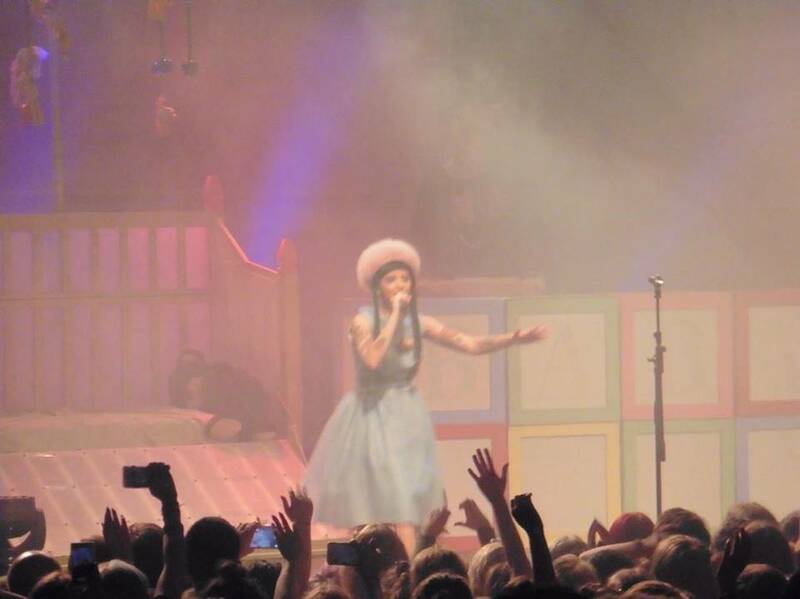 Wendy House – Melanie Martines, Cry Baby Tour @ the O2 Forum, Kentish Town. Thanks for reading, if you liked this you might enjoy my Panic! At The Disco write-up from earlier this year!